Oh, what I wouldn't do for a Sourdough Jack, or one of those grilled deli sandwiches right now, with some awesome JITB fries, and ranch dressing. Maybe a GINORMOUS Dr. Pepper or Oreo milkshake to wash it down? Yes, please. Plus, how can you not love the JITB mascot, Jack?! 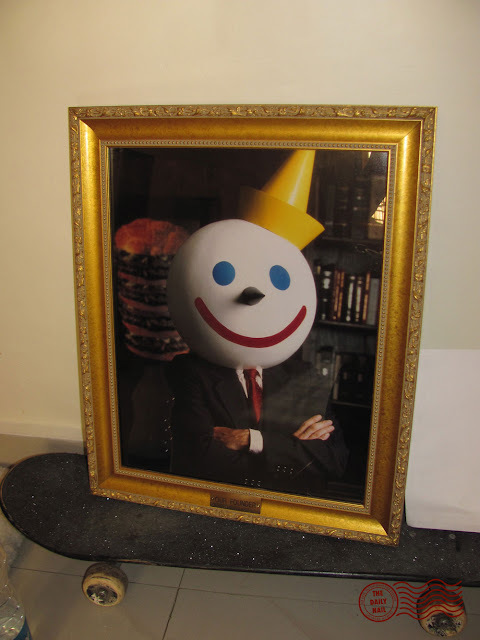 You know those portraits of Jack in the restaurants that have the plaque that says 'Our Founder'? Well, you can order them from the company, and yes, I bought one for Chris for his birthday a few years back. :-D It's pretty much the coolest thing ever. Chris is also drooling over the Jack halloween costume, he really wants a big Jack head, I'm pretty sure he'd wear it everywhere if he could. I've had Jack on my list of nail art ideas for what seems like ever. I actually had to go back through my nail designs to make sure I hadn't done them yet, because I couldn't imagine that I hadn't. Well, I didn't...until now. I originally planned to make this manicure a progression of the different versions of Jack over the years, but I decided to stick with the current Jack that we all know and love. So, who's going to send me a cheeseburger? I used American Apparel Hassid as a base, with white acrylic paint for the head (white nail polish never seems to cover over black), shaded that with a mix of the paint and American Apparel Hassid. For the hat, I used American Apparel Manila, then shaded with Barielle Coco Bar. For the eyes, I used ALDO I'll Sea you in Ibiza, the nose is American Apparel Hassid, and the mouth is Zoya Carmen. Topped everything off with 2 coats of Seche Vite top coat. 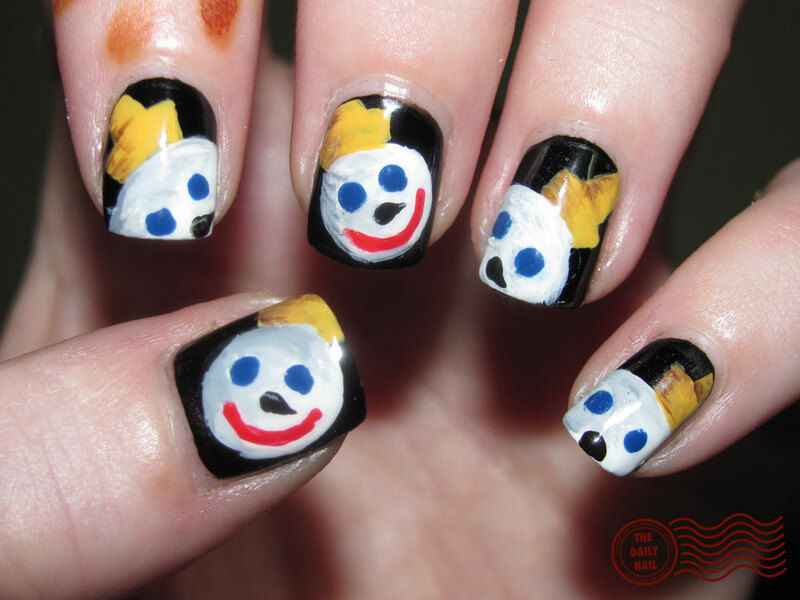 Amazing Manicure... Jack in the Box is one of my favorite fast food joints! In fact after my husband proposed to me we went over to Jack in the box.. I know I'm super Classy! You are such an artist with your nails! I love this one :) We recently got a Jack in the Box where I live! I was reading one of those top 10 lists of mascots that people don't respond well to and I recall Jack being one of the top contenders! I'll be honest, I'm one of those people who find him absolutely terrifying. So funny, I grew up with my parents hating Jack in the Box so I don't think I ever have actually eaten there. Also, I can't STAND the Jack character in the commercials, so it's funny for me to see someone that likes him so much!! Too hilarious! Too cute! I love Jack in the Box, unfortunately we don't have them here. I love their sour dough burger. Funny nails! You are a great artist. I could really go for some pie! This is adorable! I laugh, though... my step-grandmother absolutely HATED Jack, to the point it was almost a phobia! 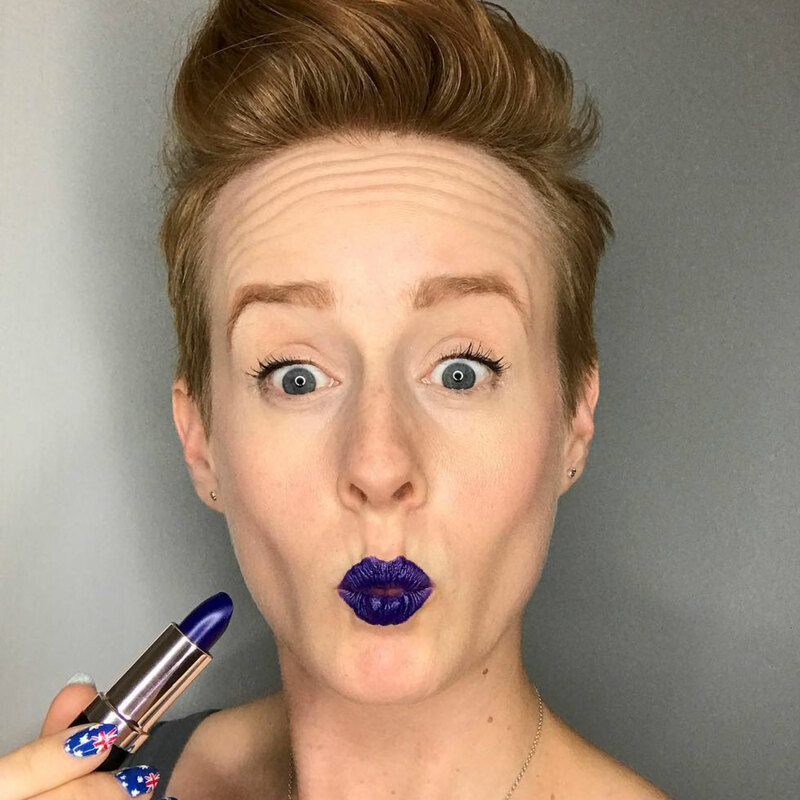 Every time she would see a commercial for JitB she'd start ranting... "Who is that big-head guy? I just can't STAND him and his big ole' head. That's just stupid, having some big-head guy like that..."
I don't care one way or another about Jack, but I like the way you used his image on your nails!